Server rooms are the heart of every company. Modac offers the optimal solution for Data Centre Monitoring. Keeping your servers in an optimal environment is essential. 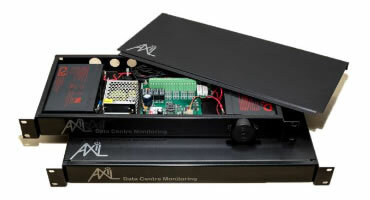 Having been in the computer facilities industry since 1985, we have developed the Axil Server Room Environment Monitoring and Control Facility that will monitor your server room 24/7. Your IT department is able to receive notifications should the environmental conditions in your server room change. The notification will be received immediately by the 4 priority cell phone numbers loaded directly onto the Axil unit or via email. A further 200 numbers can be sub-loaded onto our base station to receive these notifications. Our Base Station will log all alerts and control events for auditing purposes. Up to 15 Sensors per input port. Digital inputs each with 2 messages, one for alert and one for alert restored. 7 Day timer to control individual ports, enable or disable selected ports depending on the time and day of the week. All alerts are logged, stored, and forwarded by email at the customer’s request. Individual message can be sent to specifically selected numbers. Listen in caller restriction to certain numbers, this feature is used when the customer is not sure of the alert. A simple call to the room will pass programmed numbers to the microphone. Dual monitoring, our base station records all events, the recipient does not need to record events, statistics or alerts, these are obtainable from the base station.